Google has released a new version of the Google quality rater guidelines, and one of the most significant additions was creator reputation. Instead of just focusing on the reputation of the website itself, Google wants the raters to now look and see what the reputation is of the creator of the content. Does this person have a good reputation? Are they well-known in the field? Do they have a lot of experience or credentials in the area they are talking about? These are all things that site owners need to consider now. Previously, Google’s quality rater guidelines focus primarily on the reputation of the website itself, and in turn, the reputation of the website owners. So many sites did things such as beef up their about us pages, made sure there was a valid contact information, and even included company info in some sections of the website, such as an FAQ. But now, site owners need to consider the reputation of their contributors. For some sites, there is one author for the entire site. In these cases, having a short bio and then a link to a full author page, which would include things like their credentials or experience is perfectly fine. But when you have multiple contributors, this can be a bit more problematic when you need to show expertise for each one. Even more important is the fact that Google is telling their quality raters to rate websites lowest when the content creator has a negative reputation or is written by an author that they cannot find any information on whatsoever. If you do a search for your current contributors, what do you see? Or can you find anything at all? While the fact that a quality rater rate the specific website low or lowest does not have a direct impact on the live search results, it is still an example of the types of sites that Google wants to see ranked lower in the search results. And it is highly likely that Google’s constantly changing algos are trying to adjust in order to reflect creator reputation as well as site reputation. In other words, if your site or specific pages have characteristics of pages Google wants to rank low, you need to figure out how those pages are lacking and correct it, before a newer algo can accomplish it. And one of the key additions to the latest quality rater guidelines was creator reputation. There are many sites where there could be a dozen or even hundreds of contributors who are all writing content on the site. And something many site owners have been rather stingy with is offering their authors bios or links, because they don’t want to send their traffic offsite, particularly if they have paid the author for that content. But now in Google’s point of view, they want to ensure that those authors should be trusted, and raters need to research to confirm that yes, they should be trusted or that page will likely be rated low. Don’t forget that this isn’t just for Google, or Google’s quality raters. Your site becomes more authoritative and trustworthy when site visitors are easily able to tell that they should be able to trust your writers as well. And this would lead to additional perks such as more shares or links to your site. While your motivation might be to make changes because of Google, the effects are far-reaching and benefits your site well beyond the realm of Google. So what are things that site owners can do to showcase their content creator’s experience, reputation, and authoritativeness? And what can those content creators do to help show off their reputation so site visitors trust what they write? Often times, site owners view bios that they offer contributors through their site as a necessary evil in order to have those writers. But now with these new quality rater guidelines, site owners really need to think about the bios they offer their writers. But with creator reputation being an issue, site ownership encourage their authors to have a detailed bio, one that can show off their expertise and experience of whatever topic it is the writing about. Include a biopic for your authors. Sometimes a reader might not know who the writer is, but sometimes seeing the headshot of that writer may remind them about who that person, such as “oh, this is that expert I follow or see retweeted on Twitter.” Definitely encourage the use of a photo that the writer is commonly associated with. If your site has resorted to funny bios, or some kind bios that don’t highlights skills and expertise of your writers, you’ll want to rethink that, or the very least include some of those raters accomplishments as well. For WordPress sites, there is option to fill in a field for a biography for all account profiles. There are also many plug-ins, both free and paid, that include options to dress this up a bit and make it look more professional and to add more features such as links within the bio and additional link fields to cover a variety of social media profile links. They also add other features such as adding an author photograph, support for multiple contributors to a single page and expandable profiles. Don’t worry about the fact that someone might click off your site and visit your writer’s links instead. It’s not just quality raters that want to get a better sense about authors on their favorite sites, but also those who visit your site as well. So even though many people are doing this for Google purposes, it does benefit the user as well. While you don’t want to have a 500 word bio for a rater on your site, you definitely want to have it be a long enough that they can show off their expertise. If you’re only allowing a sentence or two, you’re not to be able to show off to your site visitors why this person is an expert and they should trust them about what they say on the topic. For this reason you don’t want to put a specific word count, but rather say we want a bio that shows off why you are an expert. You can also expand on offering your writers bios by also offering an expanded version of it, where they are able to go much more in depth about their credentials or expertise, without it cluttering up the bottom of every article with a huge long bio. Some sites do this only for their highest level or most frequent contributors, but it is a great idea for any contributors to your site. You can also expand on the types of links offered as well. While you might only want to include website, Twitter page, Facebook and LinkedIn (or some variation of these) on the bio at the bottom of articles, you might want to expand that to include even more social media sites, or other important profiles in your industry, as well. On these expanded bio pages, your writers have the opportunity to be able to go much more in depth about their credentials or expertise, without it cluttering up the bottom of every article with a huge long bio. And would also likely be seen as a perk for those writers as well. Ensure that your content creators are including links to the social media profiles. Raters are told specifically to look for the social media links for creators. Even though social media profiles are essentially curated by the creator, many times you get a sense of the person simply by looking at their tweets and shares. If you see that person sharing a lot of suspect content, that can definitely influence how someone perceives the reputation of that person. For example, if the content creator writes a lot of health oriented content, but then you see on Twitter they are sharing stories about how smoking doesn’t cause cancer or eating 3 lbs of strawberries per day will cure diabetes, that will certainly result in you thinking that person is a untrustworthy in anything around health and wellness. Bottom line, you want to ensure that content they are sharing on social media is something you want associated with your site. As a reminder, Google’s quality raters look at this kind of thing as well. Even though social media bios are limited due to length, particularly on twitter, you do want to ensure that those bios are informative as well. This includes things like degrees, awards, anything that shows off your knowledge or skills. You could even make it a requirement that if they want a link to their Twitter, that they have some sort of bio that acknowledges their expertise. This one deserves special mention because this is the one sites where individuals can really show off. Make sure the linked in profile is visible and not private if you are allowing contributors to link to it. Encourage your writers to show off skills, certificates, education, awards, and even specific duties within the role at whatever company they work for. These are all things that can be super important in establishing the trustworthiness and expertise of your contributors. Don’t forget that there might be other important spaces with your industry where one of your writers might have a profile, and where it might be important to include in the bio links to give your writers. For example, if the article had something to do with knitting, Ravelry is the place to be and the majority of people in the space would have a Ravelry profile page where they share things they have knit, patterns they created and possibly sell, along with other social aspects of the community such as group posts, favorites and friends. Sites are wary about linking to personal blogs, but again this can really establish the expertise of any contributor. This your site as a travel site, and when your contributors has her own personal travel blog where they share travel adventures they are on, this would be a great thing to link to because it does show their experience. Yes, it is important to research the personal blog to make sure it is something that you want your own site to be associated with. And be sure to look not just the front page, but do investigate a little in depth as well to make sure there aren’t any surprises. As the content creator, you are more limited in what you can show off on your contributed articles or other content types when it comes to reputation and expertise. If you are writing for a site that offers a very limited bio and perhaps not even a link to your Twitter account or personal site, you can also talk to the site owner and explain why bios are important and why they might want to include a fuller bio as well as social media links, if not a link to your site as well. Because the idea of creator reputation is brand-new to the quality rater guidelines, there are many site owners that might not realize the benefits of having trustworthy writers. And of course, this benefits you as well. However there is still a lot you have control over, and some of these things you can do before you even are published on a third-party sites. Building up your own personal reputation has a lot of benefits because not only are you showing off expertise on the sites you write for or contribute to, you are also building up the reputation for opportunities at other sites as well. When writing your bio, don’t be shy about showing off your expertise and experience in whatever the market area is. If someone reads an article written by you, you want your bio to reflect that your knowledge is trustworthy, even if they have never heard of you before. This means you want to include your experience, relevant education, and anything else you think might help someone reading your article as believing you know you’re talking about. Do avoid the temptation to make funny bios unless it is in a way that shows off your experience too. Because you are often limited in space for those bios, make it count. Try and use the same image for your profile everywhere you write. Sometimes someone might not remember your name, but they recognize your profile picture. A profile picture is just as important to your personal brand as your bio is. This also means you should use the same photo for social media as well, again so you’re building up that recognition on that image. You’re working with a limited space for most social media bios. You can include some of the fun stuff that many people using a bio, but you can include a link to the full bio link in the bio space , or include one thing that you are well known for, whether it is the owner of the website, or even something as simple as “Contributor to @somesite” to showcase it. Many content creators have fairly weak LinkedIn profiles, or they just simply don’t keep it updated. Make sure your LinkedIn profile is up-to-date and showcases everything about you that highlights your expertise. This could include experience from outside the direct market area you are working in. You might work in IT now, but if you have a Master’s degree in something unrelated, you should still show that off as well. Make sure that your LinkedIn profile is at least somewhat visible when someone clicks through to it when they’re not logged in. That way they can get a quick idea of your experience without having to log into LinkedIn to do it. If you have your own personal site or company site, be sure to include an in-depth bio there as well. And here you are limited by how many links you can include, so wherever anyone has talked about you in a positive light, feel free to quote it and link to the originating source of the quote. Often times these personal about me pages are the first thing that someone looks at when they are looking for the reputation or background of a particular content creator. So make sure that this looks professional and really puts yourself forward in the best light possible. You should also include contact information here, even if it’s just a contact form. Make it easy for people to contact you if they need to. Google specifically says the ability to contact the creator is the sign of a good reputation. You can also include links to content of yours that has been published on respected sites, as this also shows off that your reputation is high enough that these respected sites have published content of yours. Be sure to keep this updated as well, it is easy to let this get outdated and missing important information that enhances your reputation and trustworthiness. Think of a book cover, where people write brilliant quotes and raves about the author and the book. Chances pretty good that you have some great quotes or testimonials from others that are respected in your industry or field. Be sure to include those on on LinkedIn or in your personal bio. When someone sees that you are raved about by someone they trust, that makes you yourself more trustworthy too. Have you won any awards in your industry? It doesn’t have to be a major award, but even smaller, less well-known awards can show off your skills or knowledge if it comes from someone who is well-known. Be sure to add this wherever it is relevant on your personal “About me” page or your LinkedIn page, or wherever else you think it is relevance, even your author bios if there is room. Be aware that everything you share online can be associated with your reputation as well. There are tons of cases where tweets come back to haunt someone, when someone takes the time to dig through a twitter account history. So be mindful of what you’re sharing, and whether the sites you contribute to want to be associated with what you are sharing. This is particularly true for things that you might mean to come across a sarcastic or as a joke, but that others may not see that way. This does work both ways. You might not want to be associated with a site that doesn’t agree with your views of what you post as well. The addition of the creator reputation in latest quality rater guidelines raises a lot of interesting questions about how best to show off the reputation of not just the site and the site owners, but if there contributors as well. Oftentimes writers don’t show off their expertise, or they might highlight it only on LinkedIn but nowhere else. 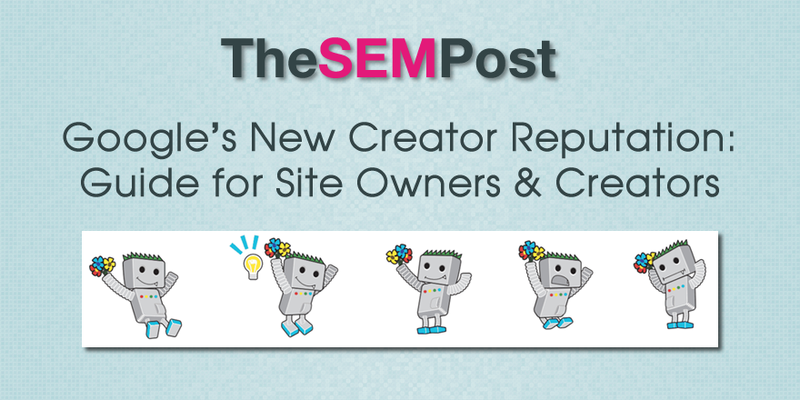 But with creator reputation, it has become important not just for the site owners to show off the reputation of their contributors, but for the creators themselves to make it easy for site owners, site visitors, and quality raters to learn more about why they should be trusted with the topic they are writing about. It also has the advantages that it gives the content creators a bit of the boost in being able to ask for things like an author bio or a link to their personal website or social media accounts. It is important to remember that creator reputation just isn’t for quality raters. If your site visitors are able to learn about your writers, and be able to learn why they should trust them, it makes your entire sites more trustworthy in the eyes of your visitors.